Slate Roof Central Message Board: Snow rail clocked installation? That is no what snow rails are for, it may work but not the way you are thinking. You would want to add to the valley, to deverd the snow that way. In addition a snowrail on the upper roof would need to be added. If you installed the snowrails on that side low enough to catch the snow from the valley, then add a pcs of steel or copper to the rail system then I could see the snow falling of the roof as you are suggesting, the same would work on the upper rail to. I am sure you could do that, but I am also sure that it wouldn't work too well if at all. Perhaps a snow rail system on both planes to keep the snow up on the roof until it melts? That is how it is normally done anyway! indeed, same goes for the other side. the gutters are stained and timy for the amount and speed of water/snow they receive. the liners at the valleys have been replaced. It looks to me like just as much gets dumped from the other roof plane to the left . Are the gutters as stained as the picture suggests ?? Do you have problems with the metal liners ? We live in Mass. and hence we have a lot of snow. As you can see from the photograph of our house all the snow from the slate roof ends up on our deck. Can you install, for example, a 3-rail snow system at about 15-30 degrees c.w. 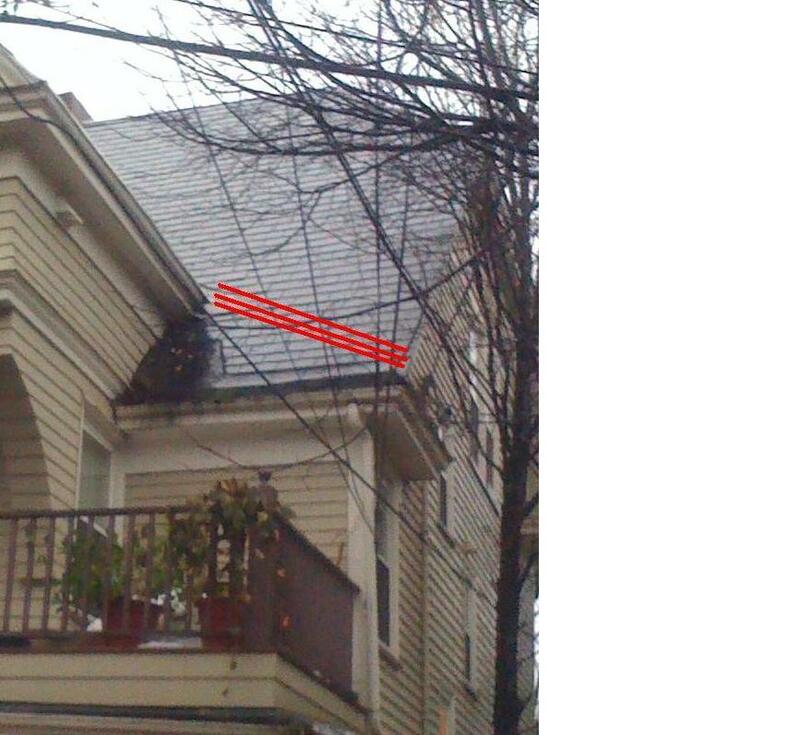 angle (as shown with 3 red lines in the photo) that will not just stop but most importantly redirect the avalanche to the right hand side of the house (so no need for me to shovel)?